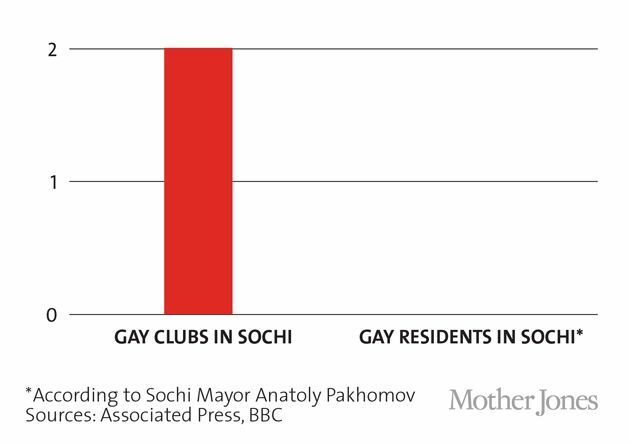 According to the mayor of Sochi, which will soon play host to the Olympics, there are no gay people in his town. Yet there are thriving gay nightclubs. How can gay people be invisible all the time except for during the night, when they come out in droves? It must be sorcery. In a video report, the BBC’s John Sweeny attempted to find out what the mayor of Sochi thought about his gay constituents. It turns out it’s a moot point because, as Mayor Anatoly Pakhomov explains, “We don’t have them in our town.” When Sweeny asks if he’s sure, Pakhomov responds, “I’m not sure. I don’t bloody know them.” What makes Sweeny so sure that there are gays in Sochi? He’s just a typical Western outsider trying to impose his own beliefs on Russia’s traditions. Well, as he tells the mayor, he went to a gay club the night before. And, indeed, despite the non-existence/ the mayor not “bloody” knowing any LGBT people, one club is so popular, it draws 400 people a night. Not only do the gays become visible only at night and hide from their mayor, they promote – see? I told you – sorcery. Speaking of imposing ideas, when Sweeny asks Pakhomov if gay people will be welcome to the Olympics, the mayor responds: “Our hospitality will be extended to everyone who respects the laws of the Russian federation and who doesn’t impose their habits and their will on others. But yes, everyone is welcome.” It certainly sounds very welcoming. Almost as hospitable as when Putin, last week, said that gay people were welcome, as long as they didn’t contaminate the youth with their propaganda. Or their sorcery, he should have added.